Each foodie, each weekend kitchen warrior who has dreams of being a chef, has recipe equivalents of the Himalaya mountains. Recipes that seems so intimidating and so difficult that we can only wonder if we will ever have the skill and the will necessary to tackle them. Also, we can only wonder whether the people who share our kitchen will let us make as much of a mess as we might need to, in order to reach these culinary heights. For me, pasta is one of those summits. Maybe not an Everest or K2, but certainly my Nanda Devi. I know what you’re thinking: how hard can a dish with only three ingredients be? 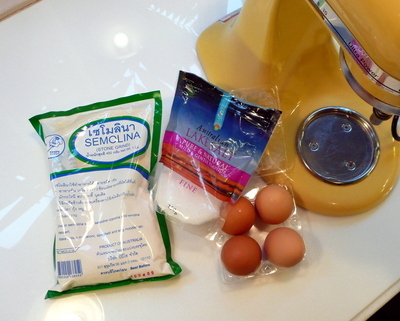 Flour, a little salt, and eggs. Maybe a splash of water if the eggs were small. But for years, I have wanted to try making my own pasta. Would it really be as good as they say homemade pasta is? The opportunity finally came about when, after years of accumulating points through my business travels, my employer finally discontinued corporate membership in the American Express Rewards program. Unsure what to do with the points and not wanting to redeem them for gift cheques, which carry half the value of gift certificates, I opted for a Williams Sonoma gift card. Thankfully, Bruce was coming for a visit and was going to be traveling well short of the three-bag check-in limit. So he kindly agreed to lug the extra fifteen pounds of pasta roller attachments I ordered for my trusty Kitchen Aid stand mixer. Unfortunately, we did not have the opportunity to mess up the kitchen, er… make pasta, while Bruce was here. So I had to scale the culinary heights on my own. Using the mixer, I whipped up the dough easily enough. You combine the ingredient in the bowl, stir them with the paddle attachment for thirty seconds until they come together. Then you knead them with the dough hook for about two minutes followed by another two minutes of hand kneading. Then the dough sits for about twenty minutes. Unlike with pastry dough, flour is not your enemy. In fact, you want the dough to be a bit dry so that it doesn’t gum up the rollers or cutters. Pastry dough is very forgiving. The first patch I cut was too soft and the cut fettucine clumped back together when piled in little nests. No worries: I just pressed the noodles back together and started the rolling process again. It was a little less of a mess than I expected, but you need lots of room (and lots of wax paper) to stretch out the dough and the cut noodles. Maybe that’s what the dining table is for? Or the clothes drying racks? The rolling was easy enough. You started at the widest setting and passed the dough through several times, folding it in thirds between each pass. The net effect of this is to further knead the dough, making a smooth, pliable and very resilient dough. After about five passes, I turned the knob to the next smaller setting and sent the dough through two more times, this time without folding the dough between passes. I continued the process until we reached the fifth setting (having started at the first setting). According to the recipe in the manual, fettucine should be at the fourth or fifth setting. In the end, I think it could have gone to the sixth setting without any problem. Switching to the wide cutting attachment, the dough sliced easily enough. As mentioned before, the fresher dough stuck together after cutting. But the pieces I allowed to air dry for a bit before cutting stayed in lovely separate strands. Again, unlike pastry dough, a little drying is a good thing. After creating some fresh pesto (large bunches of basil are about US$ 0.20 here! ), I boiled the noodles. Fresh pasta cooks fast! In three minutes or so, I was draining the noodles and stirring in the pesto. Topping the pasta was a fillet of salmon, baked in parchment paper with a simple salt and pepper seasoning. So the obvious question: was it worth it? Well, the pasta was delicious and it had a texture that was much nicer than any dried pasta. 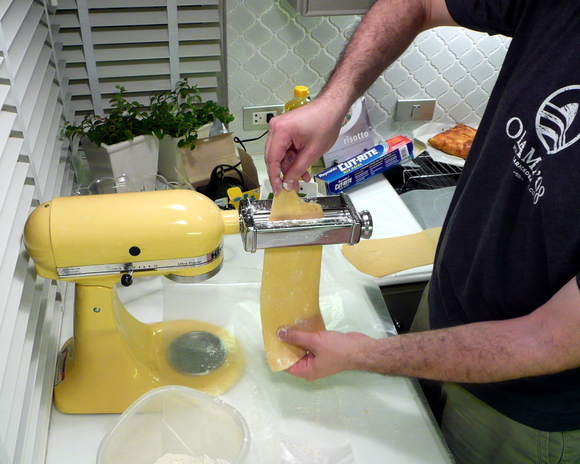 I don’t know if I would spend the hour preparing fresh pasta for the everyday weeknight dinner. But since fresh pasta can store refrigerated in an airtight container for a few days, I could easily make a double or triple batch on the weekend and save it for the weeknights. Also, I’ve very curious to try ravioli and lasagna with the fresh pasta, both of which I think will be amazing. Stay tuned for that. As a dessert, I pulled together a farmer style peach pie. 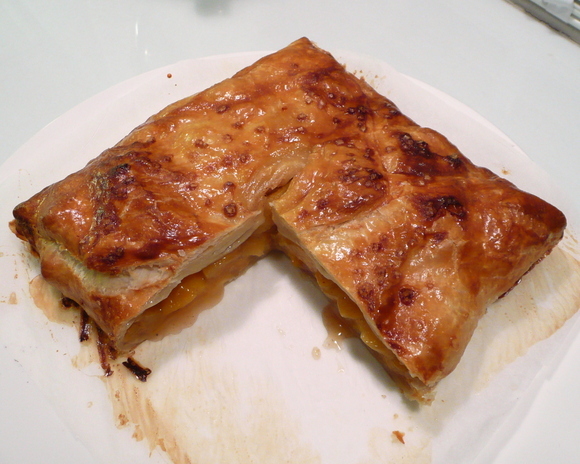 I confess, I used frozen pastry dough and peaches. But it was delicious! This entry was posted in Uncategorized and tagged cooking, cuisine, food, pasta by christao408. Bookmark the permalink. You can also freeze pasta dough for later use. It works best if you make little nests out of your pasta noodles and freeze them that way. You can then just dump the pasta into your boiling water to cook whenever you’re ready and it still tastes great. wow, impressive! 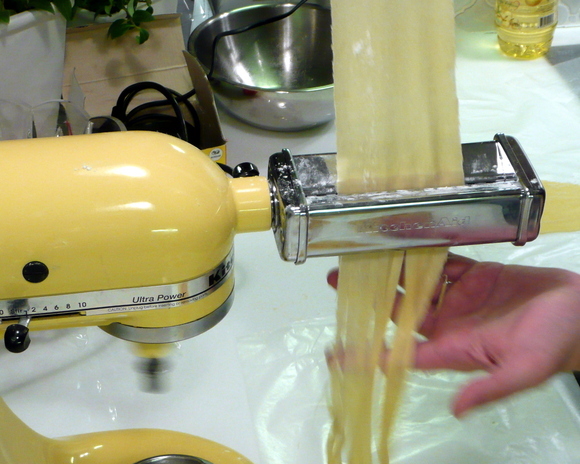 i remember making homemade pasta in home economy class in high school. it’s good but takes too much time. i don’t think i have the patience to make my own pasta when there are so many boxed varieties these days. good job!! Wow, a star is born! You are a natural. Making pasta from scratch, my goodness. Looks really yummy. I wish Xanga allows a tasting option, hehe. Italian grandmother? that almost threw me off, what a nice touch of humor. Does that mean next time you try to make wonton noodles, you will mention you have a chinese brother? lol Great job, bravo, encore! Just watched the video while procrastinating from work … hahaha. You make it look so easy. Great job! I could have told you it was easy. I make it occasionally. I agree, the mess and the amount of time it takes makes for a special occasion only though. I actually dried it once and then froze it. Worked great. Your pasta loks great! Is it al dente? I love freshly made pasta. Yay! I actually wore out my first black Kitchaid mixer (same madel as yours) from over use! I got a professional one for Mother’s Day. I have been wanting this and other atttachments. You sold me on the pasta one though. I can retire my hand crank one. Your pesto looks wonderful – how about sharing your pesto recipe with your Xangan friends? 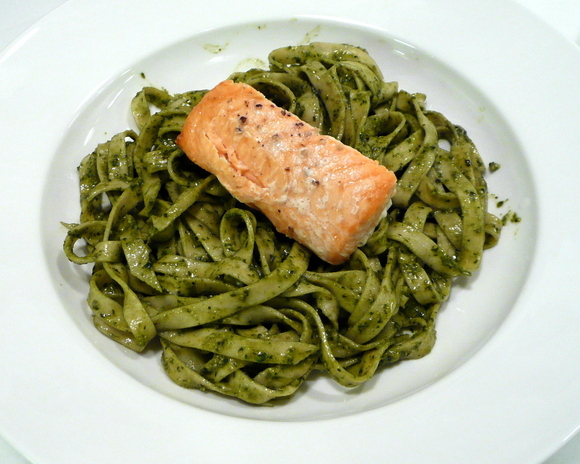 I have tried several versions of pesto – none of which are as good as yours looks! You do make it look so easy! The how-to video was very entertaining… you should make them more often. Thanks for inspiring me to be a better cook, and for your most recent comment on my blog. @TheCheshireGrins – I didn’t realize you could freeze it, too. That’s an excellent idea, especially for sheets of pasta. So much easier to pull together a lasagna. @Thatsfirecracker – @ElusiveWords – @generasianx – Thanks. Wish I could have you over to try it. @babydot74 – Yeah, the time issue is real. I guess since I don’t have TV at home, cooking is kind of my mindless entertainment. @stevew918 – You’re too kind, Steve. I wonder if I could make wonton wrappers with this? That’s a good idea. @stebow – I bet homemade pasta sheets would go great with your mom’s lasagna – one food I dearly miss from the US! @zacksamurai – Cooked to a perfect al dente, and the fresh pasta definitely has better “toothiness” than boxed pasta. @socaltransplant – Looking back, I wish I had purchased the lift-bowl model, too. There are times when my model is a bit small, especially if I want to knead a double batch of dough. The big drawback with the pasta rollers is the price – $170. I did it only because I had an AmEx gift card and no way to redeem for cash. Otherwise, it would be a might hefty price to swallow. @murisopsis – Well, I don’t use a recipe. I take two large bunches of sweet basil, pull off the leaves, add a small handful of pine nuts (better if you toast them first but not critical), a clove of garlic and a little extra virgin olive oil. I start blending it (I use a hand blender but a food processor is good, too) and add olive oil until I achieve the right consistency. Then I grate in a healthy amount of parmesan cheese, add a small splash of lemon juice to preserve the color, and then add a little more oil if the mixture isn’t smooth enough. Finally, taste and correct with some salt and pepper if needed. You can make a big batch and freeze it in paper cupcake liners. Put them in a ziploc bag once solid and then you have a supply of pesto ready anytime you need it. @ansar_al_Eisa – But it is one of my most comfortable t-shirts. @euphorie – Thanks for the kind words. I have no doubt you are a wonderful cook just as you are a wonderful teacher. @christao408 – Brilliant. I shall never be without pesto again! I just ate dinner, but my mouth is watering seeing the pie! You are amazing!! I would love to sit at your feet and learn the art of cooking. No TV at home? You continue to surprise me and make me feel so proud that I know you. @ZSA_MD – Very nice of you, but I’m sure I have much more to learn from you! The lack of TV is definitely not from a lack of Tawn trying to convince me.